Please consider whether you need a Party Wall agreement prior the start of your project, as responsibility for serving Party Wall notices lies with the building owner (the person planning the loft conversion). The Party Wall Act 1996 comes into force particularly in terraced and semi-detached homes and blocks of flats, although detached homes may not be exempt, depending on where the boundary lines of the plot are drawn and the walls are constructed. Essentially, a ‘party structure’ is any wall, floor, foundation or other structure that sits astride the boundary of a property or is used to separate distinct properties. If you plan to build across a boundary line, excavate near a neighbouring building or carry out work directly adjacent to a party structure (even if the work doesn’t extend beyond the centre line of the structure), you must obtain WRITTEN CONSENT from the adjoining parties. Before Best London Lofts begins any work to which the Party Wall Act applies, you will need to notify the adjoining owners two months in advance via a Party Structure notice. If your neighbours agree to follow the simple process involving the Party Structure notice, Best London Lofts can send you a sample template. 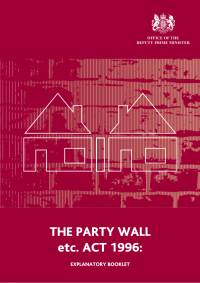 Otherwise please review ‘The Party Wall Act 1996’ explanatory booklet, provided by the Office of the Deputy Prime Minister. If any dispute arises, the building owner should appoint a surveyor to resolve the matter prior to starting any building work.